Melanoma is a cancer of pigmented cells in the skin. Although it is not the most common skin cancer diagnosed in Australia and New Zealand, it is the most serious. About 85 people out of every 100 diagnosed with a melanoma will survive if it is detected and removed at an early stage. A melanoma that is not treated early can spread to other parts of the body and become life threatening. Melanomas occur more frequently in men than in women. Men are more likely to develop a melanoma on the face, back and chest. In women the arms and legs are the commonest sites. A melanoma can occur at any age, but rarely in childhood. 'D' - the width of a harmless mole tends to be less than 6 millimetres. 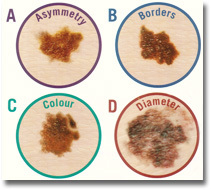 An early melanoma is often more than 6mm. The complete 'Melanoma Surgery' pamphlet is available from your plastic surgeon, Mr Murray Beagley. Plastic Surgery Auckland is an Affiliated Provider to Southern Cross Health Society for skin cancer diagnosis and skin cancer treatment.